The Cotswolds has to be one of the most beautiful areas in England where holidaymakers can book a country cottage or house. The Cotswolds are a range of hills that run from Bath in the south through Gloucestershire, parts of Oxfordshire and almost all the way to Stratford on Avon in Warwickshire. In these 90 or so acres of lovely landscapes are farms and pretty villages and a quality of life that can only be aspired to by most. The area is most convenient for weekend country or short breaks for people from London and offers a rural retreat from the city. The area can also be reached reasonably easily from the Heart of England and from parts of Wales such as Monmouthshire. Wiltshire is also not too far away from the Cotswolds. Visit the Cotswolds for a self-catering cottage holiday and enjoy the heart of England at its best. Sometimes described as quintessential England, the Cotswolds have a timeless charm and are traditional for all that is good and pleasant in life. The rock forming the hills is a pale limestone which is also used extensively as a building material. The resultant honey-coloured cottages and houses are pleasing to the eye. Even some modern houses have to comply with the regional building convention so that the Cotswold area has a character and style of its own with beautiful honey coloured buildings. The Cotswolds is an area with a rich heritage and an area known for beautiful English gardens. There are many old country houses to visit in the Cotswolds, many of which have splendid grounds and also a good number of gardens also. For those who love anything old and historic, there is a multitude of centuries old buildings to enjoy and more antique shops than most- Tetbury in Gloucestershire boasts over 30 alone. And if you love English cream teas then you will love life in the Cotswolds. There are many pretty tea shops where you can indulge in tea and a cream cake - just heavenly. If you enjoy a glass of wine in the evening, there can be nothing better than sitting in a Cotswold garden and enjoying a drink on a summer's night. Pretty villages and towns in the Cotswolds include Bourton on the Water, Painswick and Chipping Norton to name just a few. There are many beautiful places in the Cotswolds though but the smaller villages are particularly charming. Read our guide to the Cotswolds' prettiest villages. Chipping Campden is an old Cotswold town with many preserved historic buildings. England abounds with centuries old churches and Chipping Campden has the splendid example of 15th century St James Church which was funded by wool merchants buying prestige and a ticket into heaven. There are also the 14th century Woolstaplers Hall, 17th century market hall, old silk mill and almshouses. A walk around Chipping campden and many other Cotswold villages is a walk back in time because of the wealth of history and preserved ancient buildings. Bourton on the Water is a popular Cotswold town which attracts lots of visitors. This place is stunning, and marketed as the Venice of the Cotswolds, by virtue of its numerous pretty bridges which run through the town. There is also boutique shopping and tea shops galore. Bourton on the Water is a gorgeous place but is not a well kept secret and attracts a good number of tourists. If you want to spend a break in the Cotswolds somewhere charming but quiet then the villages of Upper Slaugher and Lower Slaughter are peaceful and off the main tourist track. These villages are utterly enchanting and so quiet that the only sound you should hear should be that of the river flowing by or the birds tweeting in the trees. The cities of Oxford and Bath are not officially in the Cotswolds but are located just outside the Cotswolds. Both Bath and Oxford are amazing historical cities which are just great to visit on self catering holidays. The Cotswold Water Park is a series of lakes offering fishing, pleasant walks and bird watching. Holiday homes have been built around the the lakes to take advantage of the water for water sports and sailing. Several secluded country cottage can be found located in a peaceful villages of the Cotswolds. The Cotswolds has a reputation for a higher quality than elsewhere. You can expect comfortable holiday accommodation, although it may not be spacious if it is in an ancient period building. There are plenty of comfortable holiday cottages with 2 double bedrooms, some with a king-size bed, an en-suite bathroom, a private garden and Wi-Fi Internet. Do come and enjoy a peaceful stay discovering the charm and history of the Cotswolds. Visit country markets, Belnheim Palace, National Trust properties and welcoming village’s inns are all close by.... also available for the Cheltenham Cup each year. Close to Cirencester is the source of the River Thames and the remains of a Roman ampitheatre. Prince Charles lives close to Tetbury and Princess Anne a few miles away near Minchinhampton. There are numerous pubs, many with outdoor seating during the summer for enjoying meals and drinks en-route. 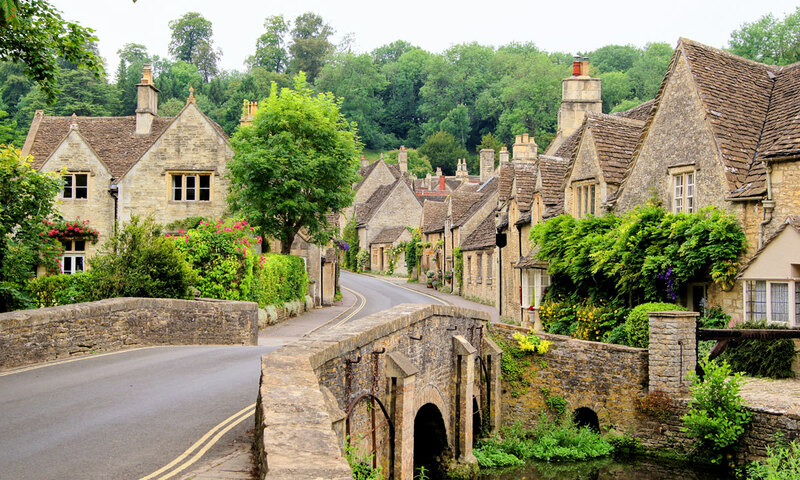 Our American friends are fans of England and the Cotswolds because they like those visible centuries of history. See vacation rentals Cotswolds England. self-catering country cottages in the Cotswolds.